L och Laurel Nursery is a relatively new nursery that specializes in new and hard-to-find camellias. Living in Valdosta, Georgia for the past 20 years, I became good friends with Hulyn Smith. It was great to see the flowers at camellia shows, but plants that would grow those flowers were rarely available. So in the late 1990's, I decided to grow a few plants. With the help of Hulyn and other good camellia growers, I started the nursery. Each year I try a few new varieties and discontinue those that do not thrive under local conditions. My fascination with plants started as a child and led to my obtaining a degree in Plant Science and a Masters in Plant Pathology. With my extensive knowledge of plants, I decided to try growing camellias a little different than other growers. Being a plant pathologist, I focused on ways to reduce the incidence of dieback in year-old plants. The first thing I did was to grow all my small plants using capillary irrigation. This provides water without wetting the foliage and is extensively used in the foliage industry. By keeping the foliage and stems dry it reduces the spread of the dieback fungus from plants that were infected as cuttings. All our plants are grown from cuttings on their own roots. This practice results in plants that are sturdy and fast-growing, without the weakness which can form at a graft. We are also world innovators in root enhancement techniques that result in plants that have stronger, more well-developed root structures that will transplant with ease. 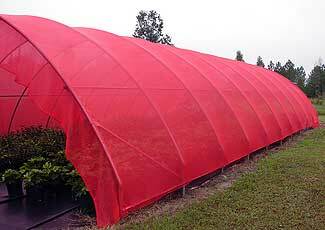 Another innovation at Loch Laurel Nursery is to grow camellias under red shadecloth. Using shadecloth other than black is called Spectrum Management. 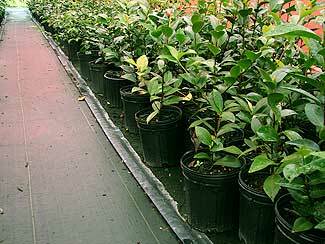 By changing the quality of light on the young camellia plants the red shadecloth improves growth and branching. Loch Laurel Nursery also practices root-pruning techniques to improve the root system of camellias from cuttings. These and other growth promoting techniques have been developed and successfully adopted by other camellia growers. This year the nursery offers over 160 varieties of camellias and a few other winter-blooming plants, primarily for USDA Zone 8. These plants are excellent garden companions for camellias, adding interest to the winter landscape.